I have always been most comfortable as a warrior. Yeah, I know, not the role the church generally teaches to women. However, the world seems more than happy extolling the virtue of woman as warrior as long as she is clad in leather and wears four inch heels, or represses her softer side in order to be accepted as a leader. I am sending you out like sheep among wolves. Therefore be wise as serpents, gentle as doves. First off, I am not implying that women are sheep and men are wolves. Believe me, I’ve met plenty of women who are wolves. Sheep, quite possibly, are the most vulnerable animal. And woman, whether we like it or not, are built to be vulnerable. We are more vulnerable physically and even emotionally – we just prefer to call it PMS. We have learned to translate vulnerability as weakness. I still struggle with seeing vulnerability as a strength. After all, my vulnerability as a woman and as a child has been exploited for another’s selfish lust many times over. Yep, that brought the warrior right out of me. But I learned to war out of my wounds, my fears, and my insecurity, and the cost was great. Only when we learn to war with wisdom and gentleness can we face the battle whole. And what territory we are defending. 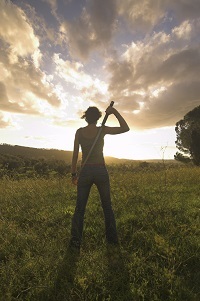 I believe that if we could learn how to protect our wounded warriors, circle around and defend those that are called to walk with another into healing with Christ and learn to defend Womanhood rather than create victims through friendly fire, then we will know what it means to be a Wise and Gentle Woman Warrior. ©2013 Cheryl Meakins, Meakins Speak LLC. Blog posts categorized as Warrior are topics surrounding the battles of fighting the right enemy, ceasing friendly fire, and covering the fallen. If you want to review just the posts on Warrior you can click on the Warrior tab in the bold purple box at the top left of the blog.